What do snowdrops look like? Snowdrop is a herbaceous, perennial plant that grows from a bulb. Each bulb produces around two to three linear leaves and an erect flowering stem with white, bell-shaped, nodding flower at the top. The genus name Galanthus is derived from the Greek gala meaning milk, probably referring to the milk-white flowers. Leaves: narrow to linear in shape and are smooth and dull grey-green. Flowers: flowers don’t have petals but are composed of six white flower segments known as tepals (they look like petals). The inner three tepals are smaller and have a notch in the tip, with a green upturned ‘v’ pattern visible. Summer snowflake (Leucojum aestivum): a defining feature which distinguishes the summer snowflake from the snowdrop is that in summer snowflakes there is a green spot marking on the end of each petal and the petals are all the same length. Spring Snowflake (Leucojum vernum): like the summer snowflake, all the petals on this species have a yellow-green mark on the end. When: it is a perennial which flowers very early, from January to March. Where: snowdrop is not native to the UK but widely planted as an ornamental and has naturalised across the country. Look for it in deciduous woodland, parks, gardens, along banks and verges, in meadows, amongst scrub and near rivers. As an early flowering plant snowdrops can be important for insects, such as flies. Ornamental: valued for its delicate beauty and as a late winter and early spring flowering plant. Widely planted in gardens and parks. 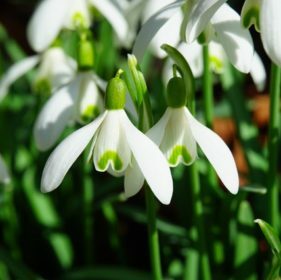 Medicine: traditionally snowdrops were used to treat headaches and as a painkiller but in modern medicine a compound in the bulb of the snowdrop has been used to develop a dementia treatment. Insecticide: a lectin compound contained in snowdrop is known as an effective insecticide. Toxicity: snowdrops and their bulbs are poisonous to humans and can cause nausea, diarrhoea and vomiting if eaten. Poetry: snowdrops appear in many poems, including those by famous poets such as Oscar Wilde (Ravenna) and John Masefield (The Everlasting Mercy).